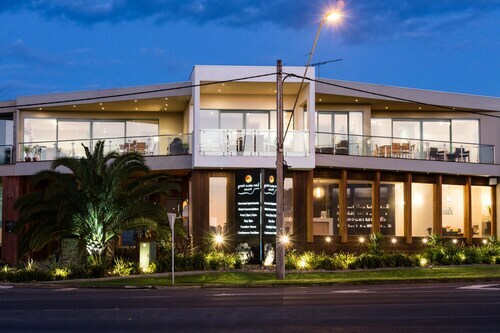 Situated by the ocean, this spa aparthotel is within a 10-minute walk of Coogoorah Park and Anglesea Surf Beach. Anglesea Golf Club and Ellimatta Reserve are also within 1 mi (2 km). 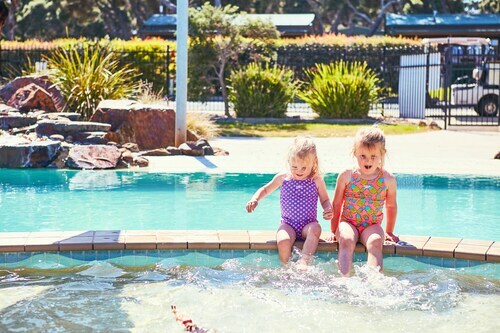 This family-friendly Anglesea campground is located near the beach, within 1 mi (2 km) of Coogoorah Park, Anglesea Surf Beach, and Ellimatta Reserve. Anglesea Golf Club and Point Addis Marine National Park are also within 3 mi (5 km). 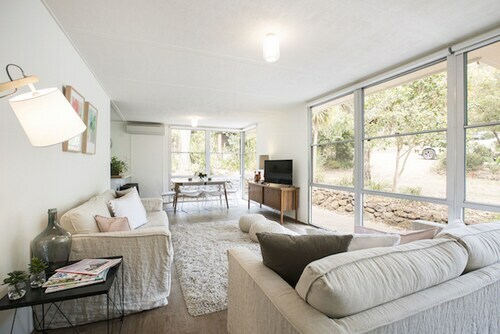 Situated near the beach, this apartment building is within a 10-minute walk of Coogoorah Park and Anglesea Surf Beach. Anglesea Golf Club and Ellimatta Reserve are also within 1 mi (2 km). Situated near the beach, this vacation home is within 2 mi (3 km) of Anglesea Golf Club, Anglesea Surf Beach, and Coogoorah Park. Ellimatta Reserve and Urquhart Bluff Beach are also within 3 mi (5 km). 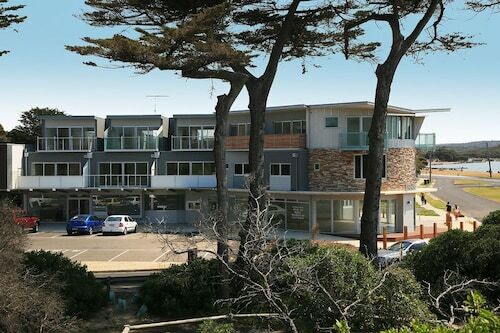 Situated near the beach, this luxury apartment building is within a 15-minute walk of Anglesea Surf Beach and Coogoorah Park. Anglesea Golf Club and Ellimatta Reserve are also within 2 mi (3 km). Anglesea is one of the many coastal towns along the Great Ocean Road, Victoria’s winding 243-kilometre stretch that lures road trippers in droves. With sweeping Southern Ocean views, surfing, nature walks and more, this charming town is a must-do destination if you’re making the journey – and an ideal getaway in itself. Between Anglesea and Lorne is the smaller town of Aireys Inlet. 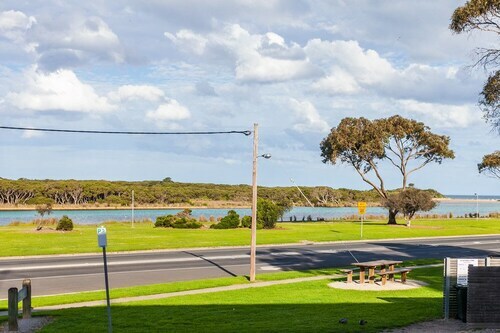 Both of these towns are peaceful places with stunning natural scenery, so look no further than us for your Anglesea and Aireys Inlet accommodation. Originally known by the less attractive name of Swampy Creek, Anglesea changed its name in 1884 when the town was formed. These days it’s a sporty place, with its own Aussie Rules footy team, cricket and golf clubs, skateboard ramps and surf beaches. But that’s not all there is to this diverse location. Drive here or jump on a bus from Geelong and find out for yourself! Stay in accommodation ranging from caravan parks to beachside apartments or even cosy cottages. You can swim or surf at Anglesea Beach or even fish at the mouth of the river. Coogoorah Park has boardwalks and bridges that will take you on a walk through the peaceful wetlands. For an authentic local shopping experience, the Anglesea Riverbank Market happens each Sunday across various locations. Everything from books to trinkets go on sale, with the event raising funds for the local primary school and other community organisations. When you feel like something to eat, Anglesea has several fresh food stores, restaurants and cafes, some with lovely ocean views. Anglesea’s golf course is famous for its Eastern Grey Kangaroos. Sadly, the kangaroos don’t play golf, but they do hang around while you tee off. Numbering around 300 in total, they’re a sight to see as they hop around the fairways. The Anglesea Art Walk features six mosaic art pieces created by local organisations. This 2.5 kilometre walk starts at the sweeping views of JE Loveridge Lookout and finishes at Anglesea Primary School, taking you through town along the way. Love rugged natural scenery? Take a day trip to Point Addis, a 4,600-hectare marine national park and surf beach with large sandstone cliffs. From Anglesea it’s a quick 10km trip to Aireys Inlet, the town famous for the Split Point Lighthouse, which was used as a location in the popular children’s TV series ‘Round the Twist’. Indulge in a photo opportunity or take a guided tour for a closer look at the place where "strange things happen". While you’re in town, take a look at Eagles Nest Fine Art Gallery, picnic or bushwalk at Great Otway National Park. Still need entertaining? Try fishing, canoeing or bird-watching. If you want to explore more of what Victoria has in store, Anglesea and Aireys Inlet are within driving distance of Geelong, The Mornington Peninsula and the rest of the Great Ocean Road including the amazing 12 Apostles Rock formations at Port Campbell. Sound like a trip worth taking? Then wot’s the hold-up? Book your Anglesea or Aireys Inlet hotel with us! How Much is a Hotel Room in Anglesea? 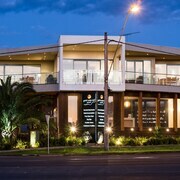 Hotels in Anglesea start at AU$109 per night. Prices and availability subject to change. Additional terms may apply. Great location, nice pool and spa. Kids also love the jumping pillow.